The value of pipe #256 is 34 points. 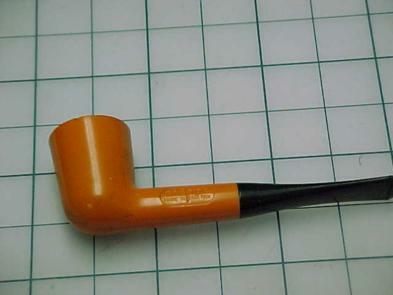 Fred Paluba offered a group of the pipe - MADE IN ENGLAND on eBay. In addition there was an English Blue Pot the pipe from the U.S. The four English pipes joined the collection and the blue American the pipe went directly to the Pipes for Sale Page. The mystery of these English pipes is described in A History of the pipe. There finally came a better example of the shape/color so this one was traded to Bill Moore for some literature and a pipe to be announced.